If you’re looking for something a little more durable, a heavy-duty belt is a great addition to any wardrobe. 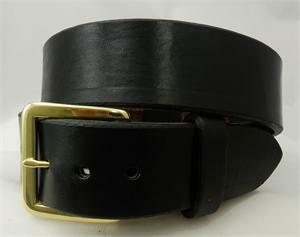 Gavere Leather uses heavyweight 12-13 oz harness leather on gun belts. If you’re searching for a new belt for your collection, personalized leather belts add customization and uniqueness to your look. With a heavy-duty fit and material, you won’t have to worry about fading, breakage, or other wear and tear. However, a heavy duty belt is not just for fashion purposes. Gavere Leather makes American-made leather belts great if you carry. Instead of buying multiple belts, our heavy-duty belts are multipurpose for fashion and everyday needs. Transform our high-quality leather belts into the perfect gun belt. Choose Black or English Tan, 1 1/2" or 1 3/4" width, Our belts come with a standard buckle fastened with two screw posts. Gun belts are made from Extra Heavy Weight HARNESS LEATHER (12-13oz) and come in two widths (1 1/2" & 1 3/4"). ** They are also often used as GUN BELTS by people who carry. Also available in two popular colors; Black or English Tan. Finished with a standard utility buckle, a leather keeper and two durable screw posts. (so you can easily switch buckles). Gavere Leather belts are all 100% cowhide, made in the USA. Every belt we sell is designed and manufactured in our High Springs, Florida facility.